Startup share prices pop when they go public. It’s what they do. 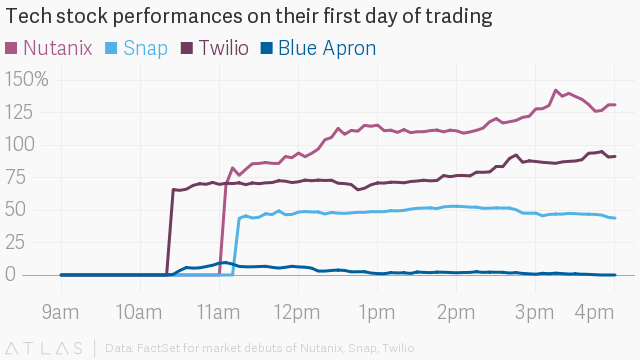 Cloud-messaging company Twilio gained 92% when it debuted on the New York Stock Exchange in June 2016. Cloud-computing company Nutanix jumped 131% on its first day of trading in September later that year. Snap popped (and crackled) 44% during its IPO this March. Other memorable first-day showings in recent years include Etsy (+88%), Coupons.com (+88%), Box (+66%), LendingClub (+56%), Shopify (+51%), Zendesk (+49%), and Fitbit (+48%). Silicon Valley’s meal-kit darling priced its IPO at $10, opened the day at $10, and closed at, yes, $10. Blue Apron is a meal-kit company, meaning it delivers most of the stuff needed to cook a meal—pre-portioned ingredients and recipes—in a box to people across the US. As a startup, it talked about “rethinking an entire food system” and raised $193 million from venture capitalists, earning a valuation of $2 billion, to do it. Presumably that is why we consider Blue Apron a tech company, even though its business consists mostly of non-tech activities like sourcing ingredients from farms, chopping, packaging, and otherwise prepping those ingredients in warehouses, and then getting humans to deliver the meal-kit boxes to its customers’ doors. The company has been hurting since Amazon announced plans to buy Whole Foods for $13.7 billion two weeks ago. On June 19, Blue Apron updated the “risk factors” section of its IPO filing to warn that “business combinations and consolidation … could further increase the competition we face and result in competitors with significantly greater resources and customer bases than us.” Blue Apron is looking at you, Jeff Bezos. On June 28, one day before its public debut, the company slashed its IPO price range to $10 to $11, from $15 to $17. Perhaps Blue Apron did that hoping if it aimed low, the market might still show some excitement, and bid up the stock on its first day of trading. “This will help the IPO trade well. … It needed this discount,” market analyst Kathleen Smith told CNBC. Instead the results were lackluster. It raised $300 million at a valuation of $1.9 billion, lower than its last private valuation. Compared to the other 133 tech companies that have gone public on US exchanges since 2014, Blue Apron is an outlier. Eighty-five of those companies recorded stock gains of 10% or more on their first day of trading, according to data compiled for Quartz by market research firm Dealogic. Eighteen of them booked first-day gains at or above 50%. 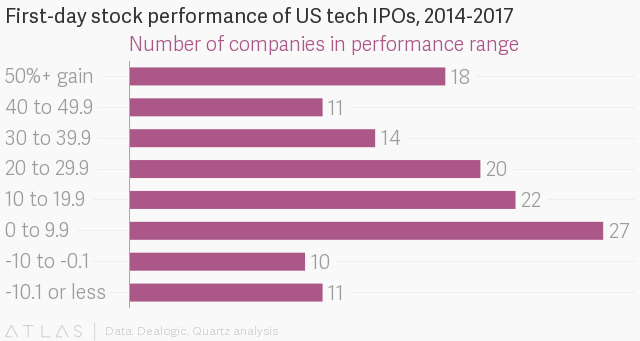 Of course, past performance doesn’t guarantee future results, as the saying goes and tech IPOs have repeatedly shown. Snap rose past $29 in its first few days of trading, but is now barely trading above its $17 IPO price. Etsy went public at $16 a share and is currently trading at $14.97. Fitbit is a penny stock. But at least those companies had their glory days to enjoy. Blue Apron may not even get that.